Need more information? Download our Data Sheets here. 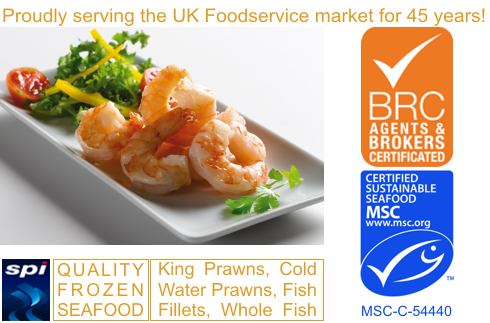 The UK's premier supplier of Quality Frozen Seafood. With over 40 years experience in sourcing the finest Seafood & Fish from around the world we are ideally positioned to be your supply partner of choice. Serving the UK Foodservice market since 1973, SPI are experts in the sourcing and distribution of Quality, Frozen Fish & Seafood. Using our expert product knowledge and unrivalled experience in global sourcing we have a proven track record in delivering high quality products with full traceability to every sector with the UK Foodservice area. We pride ourselves on establishing long-term partnerships with our customers, working closely with each one in order to deliver high quality products consistently and continuously. We offer a full product service, across the board, in every category – search below. Click upon a category for more detailed product information. For details on price & availability please contact us. © 2011 Sea Products International. Web Site Design by Stunn Ltd.